Skiing down Mt. Bachelor in central Oregon isn’t just about the snow. It’s about lots of snow – and lots of fun! 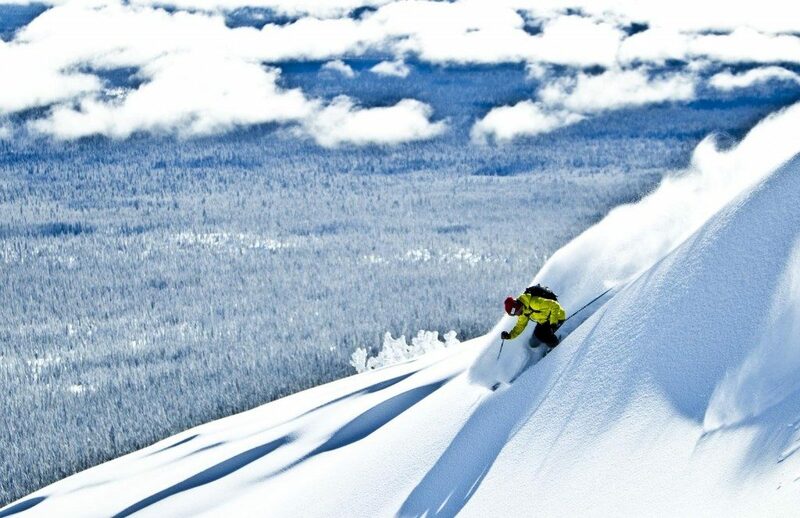 If you’re pondering your next skiing vacation, consider Oregon’s Mt. Bachelor. What does a ski vacation need to make it a success? Snow, of course, would be first on the list, and Mt. Bachelor has snow in quantity. In fact, it has the most snow of any ski resort in California, Nevada, Oregon or Washington. And then there’s scheduling. A nice long season is great, giving you the maximum chance to get out on the powder. Running from Thanksgiving into May most years, Mt. Bachelor has one of the longest seasons on the West Coast. How about a variety of runs? A bunch of difficulty levels? Plenty of lifts? On-site restaurants and other facilities? Check, check and check. When you’re surrounded by 2 million acres of pine-forested wilderness, you can definitely enjoy space, fresh air, and scenery. Overnight accommodations at the mountain itself, however, are not available. But don’t let this deter you. There’s an abundance of lodging options in the nearby towns of Bend and Sunriver, including luxurious boutique-style hotels, full-service resorts, vacation rental homes and condos. 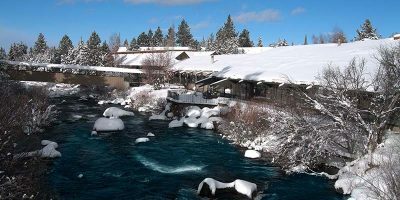 The Riverhouse Hotel and Convention Center in Bend just completed a major renovation and offers all the amenities you’d expect: gorgeous riverside dining, heated indoor pools, year round outdoor hot tubs and plush guest rooms that feature refrigerators, microwaves, big screen TV’s and wifi. To sweeten the deal, they even offer special packages for skiers and families. If you want to be closer to a vibrant downtown area, Hilton’s Doubletree Hotel has the spot for you. While the guest rooms are spacious and comfortable, with high-quality bedding and big-screen TVs, an upgrade to a suite gives you even more luxury. There’s nothing quite like returning from a chilly afternoon on the slopes to your own fireplace and hot tub, or admiring the view from your personal balcony. If skiing is not your thing but you do enjoy the great outdoors, there are other activities waiting for you at Mt. Bachelor. We’re talking about an 800-foot tubing park, complete with surface lifts to pull you up the slope. Or perhaps you’d prefer to experience a real dogsled ride, enjoying the mesmerizing scenery from an Iditarod-esque vantage point. These activities either require reservations or tend to sell out quickly during peak times. Definitely call before you go to make sure you don’t lose this chance at creating that special memory. You can find a variety of restaurants and cafés at Pine Marten Lodge, a full-service bar, a coffee bar, and an all-American eatery at the West Village Lodge, an assortment of cafés at the Sunrise Lodge on the east side of the mountain, and hearty snacks and signature burritos at the XC Cafe in the Nordic Lodge. A day in town can lead you on the world famous Bend Ale Trail where you can visit over a dozen breweries. You quickly see why Bend was dubbed “Beer town USA.” If you want to explore lava tubes, Wanderlust Tours will take you underground with a naturalist to discover how the volcanic region was born. Before you finalize your plans, be sure to check out the Visit Bend website for the latest events, deals and discounts. Recent discount offers included 25 percent off lodging fees, kids staying and skiing free, and “buy two days and get the third day” free. East Coast, West Coast or somewhere in between, it’s hard to beat the combination of snow, trails and amenities that a ski vacation in the Mt. Bachelor area can offer. No matter if it’s a first lesson on the beginner hill or an adrenaline-soaked run down the mountain, your group’s tastes and skill levels can easily be accommodated. Add in the gorgeous setting and a selection of comfortable and stylish hotels for after-ski relaxation, and you’ll see that Mt. Bachelor is a choice you won’t have to think about too hard. Mt. Bachelor is located about 20 minutes east of the city of Bend, Oregon. The nearest airport is Redmond Airport, about 20 miles north of Bend. It is served by Alaska Airlines, United Airlines, Delta Airlines and American Airlines. Nonstop service is available from Los Angeles, Denver, Seattle and other key cities. Once you arrive in Bend, you can opt to simply park your car and catch the Mt. Bachelor shuttle at the Bend Park and Ride lot on Columbia Street. Or, for maximum ski time, you can drive to Mt. Bachelor’s West Village area and park near the lifts. Should you prefer to drive into this part of Central Oregon, Mt. Bachelor is located off of U.S. 97, about 3-and-a-half hours south of Portland. As you drive, you’ll be treated to some spectacular scenery. Before you leave, remember to take into account the weather conditions.